Enjoying a fine cocktail is a sensory experience. Sight, taste, smell, even touch and sound all play a part in one’s appreciation of a well-made cocktail. But what if I told you one bar has found a way to take that experience to the next level with virtual reality? At Baptiste & Bottle in The Conrad Hotel Chicago, guests can now enjoy a cocktail that combines an in-person sensory experience with virtual reality. Called Rare Journey, the scotch-based cocktail experience is the result of a collaboration with storied scotch house The Macallan. Rare Journey is a showcase for The Macallan’s Rare Cask Whisky. which is aged for at least 12 years in a combination of Spanish and American seasoned oak casks. The result is a rich and woody but approachable whisky with notes of vanilla, citrus, and spicy hints of ginger, cinnamon, nutmeg, and clove. The cocktail itself combines the Rare Cask, Bodegas Tradicion 30-year Oloroso sherry, and virtual reality, which is listed as the third ingredient. 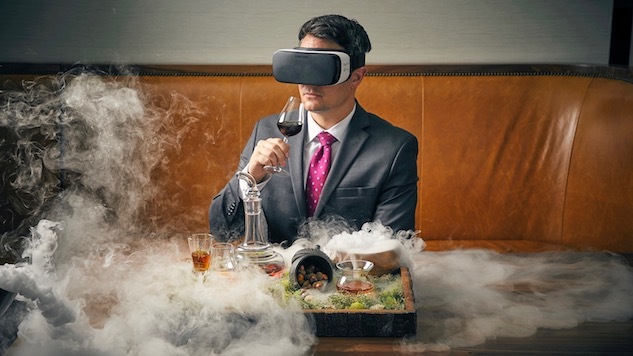 For $95, guests will receive a guided table-side experience as they not only enjoy the cocktail, but also immerse themselves in The Macallan story as they embark on a global journey via a virtual reality headset. At the table, the guest’s olfactory senses are stimulated with smells meant to complement their journey. Starting with an oak tree in a forest, guests will follow it all the way to The Macallan Cooperage in Spain where the wood becomes casks, which are then seasoned with sherry, filled with scotch and left to mature at The Macallan’s Speyside distillery. The Rare Journey experience is the brainchild of Raquel Raies, national brand ambassador for The Macallan. “My role is to educate consumers and bring the brand to life,” she says. To that end, she has embraced technology to create more innovative ways of engaging scotch lovers and bringing the often-intimidating spirit to new people. Raies notes that for younger consumers such as Millennials, enjoying cocktails and spirits is more than merely drinking them. “It’s all about the experience,” she says, explaining that while such consumers might not spend $60 on a dram of Rare Cask, they’re more willing to spend $95 on a unique immersive experience. As the first woman brand ambassador for The Macallan, Raies is also interested in bringing more women to scotch — something that has been happening slowly as interest in craft cocktails has made consumers more eager to explore new flavors. She acknowledges that scotch is still regarded as something only men drink; however, as a scotch-lover herself, she wants to dispel that notion. Currently, Rare Journey is only available at Baptiste & Bottle; however, Raies says similar experiences will likely appear elsewhere once it has been fine tuned. For those looking to create an approximation of the experience at home, Raies recommends The MacallanVR app, which features the Rare Journey VR video. All you need is the cardboard VR viewer for your phone, a bottle of Rare Cask, and the sherry. If you don’t want to download the app, you can still check out the video on YouTube. Jim Sabataso is a writer, journalist, and bar director for The Palms Restaurant Group in Rutland, Vermont. Follow him on Twitter and Instagram.